I see more and more people arguing that corporate bonds, particularly of the high-yield variety, are fully priced and thus no longer attractive. While junk bonds have certainly enjoyed a huge rally in the past two years from extraordinarily depressed levels, I think it is premature to assume they are now overpriced. 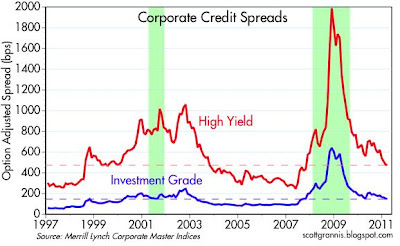 As evidence, I offer the chart above, which plots option-adjusted spreads on investment grade and high-yields bonds, as calculated by Merrill Lynch. While junk bond spreads are a bit lower than their average of the past 14 years, they are still substantially higher than they were at their lows in early 2007 and in 1997-98. 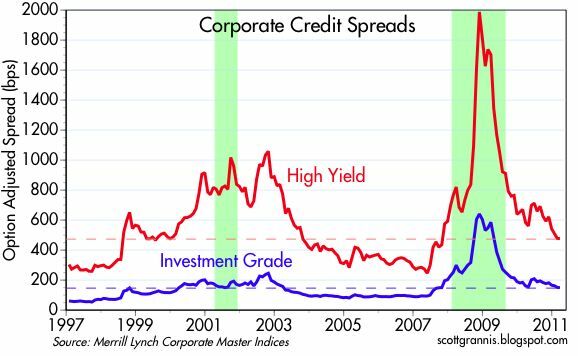 And of course those latter periods were in retrospect times of overvaluation as spreads subsequently began to rise significantly. I remember very well the 2005-06 period, when spreads were unusually low and implied volatility was unusually low. Tranquility was the norm for over two years, leading many to assume that we had entered a new era of tranquility that would last for a long time. (It's dangerous to extrapolate trends.) I worried that the market was being set up for a nasty surprise coming out of left field, but I had no idea what that might be. In any event, spreads today are still meaningfully higher than they would be if the market were complacent and willing to believe in tranquility for as far as the eye can see. Spreads are a good measure of the value inherent in corporate bonds, and for the market's estimate of default risk, but what about the risk of rising Treasury yields, which form the basis for measuring corporate spreads? What if Treasury yields rise? Wouldn't that push corporate yields higher? Well, not necessarily. 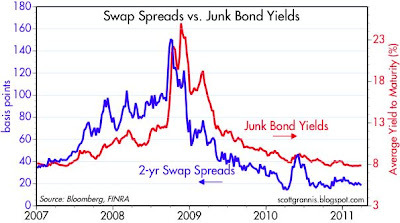 This chart compares the yield on junk bonds with the 2-yr swap spread. 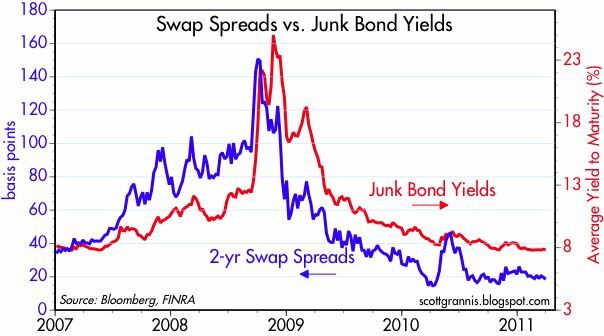 Swap spreads have typically been good leading indicators of the health and attractiveness of corporate bonds. Swap spreads currently show absolutely no sign of any impending danger or lurking systemic risk that might disturb the relative tranquility of the corporate bond market. Furthermore, junk bond yields today are at about the same level as they were in early 2007, when spreads were much lower and Treasury yields were much higher (10-yr yields were 4.5-5% in the first half of 2007, and they are currently a bit less than 3.5%). So I could argue that in a sense, junk bonds are already priced to a rise in Treasury yields of at least 100 bps. 10-yr Treasury yields could rise by 100 bps and junk bond yields could remain steady, and spreads would decline by 100 bps, leaving them still wider than they were in early 2007. Once again, here is evidence that markets are still priced to fairly conservative and cautious assumptions. Put another way, I can't find evidence to support the notion that prices of corporate bonds and equities have been artificially or unrealistically inflated. I agree with Scoitt Grannis. The horrid bear market of 2008, real estate bust, and financial collapse has made investors timid. That means it is a good time to buy. Americans lost their confidence in the Bush Administration, and Obama has done little to restore it. You can't blame a President for everything, but leadership has been poor. I get the sense if there is a pothole to step in, these last two Presidents found a way to do it. Is there any foreign quagmire we cannot dodge? Is there any social welfare program that doesn't turn into the Gong Show? Still, the private sector is resourceful, innovative. As Grannis pointsm things are mending. Sure is slow, tho. As Barton Biggs has noted , Japanese bond yields have remained unbelievably low in spite of Japan's rising government debt. Some speculate that this is because the debt is largely owned by the Japanese people. But if US government bonds fall in price (rise in yield) because of diminished confidence in the US government's (or people's ) willingness to control our national budget deficit then I wonder if other bonds i. e. corporate, high yield or municipal will hold up in price. If I thought (which I do actually) that the US government was "broken" and ineffective at solving our nation's major problems, why would I want to own any bonds denominated in US Dollars.